In 1919 Manfred Erhardt founded a workshop that was initially dedicated to the sale and servicing of industrial clocks and signal systems. Albert Leimer joined the company six years later. In 1935 E+L started to develop and manufacture the first precision mechanical units for the local textile industry. In parallel with the upturn in the textile businesses, the company grew and specialized in web guiding units for the automatic guiding of the web in textile machines. Then in 1960, Erhardt+Leimer expanded its area of activity to the paper and film/foil industries; later the printing, packaging, non-woven fabric and tire industries were added. As early as 1995 the company pioneered digital technology and introduced camera technology into its automation systems as standard; in 2000 it became involved in inspection technology. Today the Erhardt+Leimer group is a global business with subsidiaries, branch offices and over 300 service stations all over the world and a broad portfolio in the area of automation, measuring and inspection technology for the production and processing of materials in web form. The innovative power of the company is apparent in the number of patents it holds: by 2019 it held 782 national or international patent applications, patents and utility models. The primary sales market is Asia with over 60% of sales; another important market is the USA. E+L has established itself in all important industrial countries with wholly owned subsidiaries, 19 up to now. There are also production facilities in India, China and the USA. The first foreign subsidiary was founded 45 years ago in Brazil, a very risky venture in those days. The early global expansion strategy paid off: "With hindsight the founding of these companies in Europe, America and Asia was an important milestone in the development of the business," explains company boss Hannelore Leimer. "At that time we created the basis for our current global network. Without this international market presence, the success story of E+L would not have been possible to the same degree." At the top of the family-run business along with Hannelore Leimer, daughter of company co-founder Albert Leimer and Chairperson of the Board since 1977, is her nephew Dr Michael Proeller acting as CEO. Today she largely leaves the operative business to the members of the board, however her vast entrepreneurial experience continues to be in demand: "In a family business the transition from one generation to the next is a difficult phase," says Hannelore Leimer. "I see it as my responsibility to be involved constructively in this transition in our business with an orientation toward the future." At the beginning of the 20th century, Augsburg was a breeding ground for the textile industry. Back then, the finishing machines were not as automated as they are today, and the textile webs had to be guided through the process with a high degree of manual intervention by the operating personnel. This gave E+L the idea to develop the first mechanical web guider of the "KF" type, whose patent was applied for as early as 1928. The web guider is still the most economical system for guiding textile webs to date. Erhardt+Leimer has sold around 500,000 models so far. Not long after in 1932, E+L developed the first electromagnetic tenter infeed, which is still being sold today under the code "KR" (German abbreviation for clip regulating device). 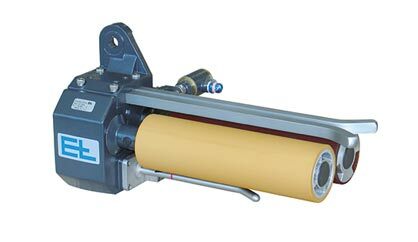 The latest model, the KR 60/62 with brushless, all-in-one compact actuating drive with integrated controller for direct mains operation, is one of E+L's most successful products together with the KF. Nearly a quarter of a million of them have been sold since being launched. As the textile industry became more and more industrialized, the production methods were constantly optimized too. This meant that higher-quality materials could be manufactured. The conventional edge guiders were no longer suitable for delicate webs. 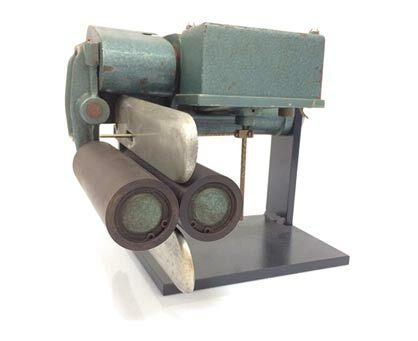 This gave rise to the development of a segmented roller guider in 1964, by means of which the textile web rests entirely on the roller and therefore is only subjected to minimal tension. In a segmented roller guider, a specific number of guide profiles are arranged around the circumference and are fixed to a guide plate. By swiveling the guide plates, the guide profiles are moved sideways, thereby correcting the web. This continues to be regarded as the best and most gentle method of guiding textile webs. Over the course of the next decades, the company developed more products and systems for the textile industry, including cutting units, metal detectors, pick and course counter systems, web tension controllers and weft straighteners, all with corresponding sensors. The Italian subsidiary offers a wide range of infeed and exit systems for textile production processes. Just as it was 90 years ago, the textile industry is still the company's most important foothold. A key topic for the future is the digitalization of production for Industry 4.0; E+L is well equipped for this change. "All current E+L components are 'I 4.0-ready,' i.e. suitable for integration in the latest generation of production systems," explains CEO Dr Michael Proeller. "Each of the E+L components manufactured in large numbers, whether it is a sensor or high-precision linear drive, can be connected actively and passively to networks. E+L technology therefore integrates perfectly into the production and/or ERP systems of our customers to make networked and therefore documented and automated manufacture possible." "A business must shed its skin every ten years at the latest, that is it must critically scrutinize its existing situation and initiate necessary changes to stay on the ball with its technology and maintain its position on the market," says company boss Hannelore Leimer. "I am proud that, despite the many economic and political challenges, we have been able to steer the business safely and stably through the past 100 years and always be aligned with the latest technology and market changes."